Donut Secret 1 is the first underwater level in the game Super Mario World. This level is a secret level, accessible when the Mario Bros. find the Key and the Keyhole of Donut Plains 1. Donut Secret 1 also has a secret exit. The regular exit leads to the Donut Ghost House, while the secret exit leads to the Donut Secret House. There are seven Dragon Coins to be found. This is the first level of the game to feature the Power Balloon. This underwater level consists of one long underwater screen and an above ground room. The player has 300 seconds on the Timer to complete the level. 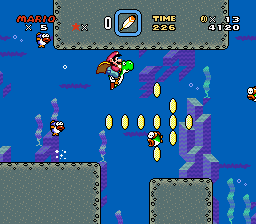 The underwater screen has many Rip Van Fish, Cheep Cheeps, and Blurps, while the underground area has Winged Koopa Troopas. To get into the area, the player must enter the first blue Pipe. Right before the Pipe are ? Blocks, and above them is the first Dragon Coin. There are two ? Blocks in the area which contain Power Balloons. There is another ? Block that contains a Mushroom or a Fire Flower. The player must use the Power Balloons to float up, and if either top corners of the room are reached, the player finds a Dragon Coin. Next to the exit Pipe from the underground area, there is another Dragon Coin. In the Game Boy Advance remake, there is a Midway Gate after the Pipe and near the P Switch. Around that same area is a Dragon Coin, in between two Grab Blocks. To the left of the Keyhole is another Dragon Coin. The last Dragon Coin can be found before the Giant Gate, hidden above a wall. The Giant Gate can be found on the right edge of the screen, a little ways past the Keyhole. The secret exit can be difficult to find, as the key requires strategic use of the P-Switch. To find the key, the player needs to carry the P-switch to the row of Blocks, and then stomp on it. This changes some Used Blocks into Coins, giving access to a ? Block. Before the P-switch time runs out, the player has to collect some of the coins and hit the ? block for the Key to pop out. The Keyhole is just right of the key.